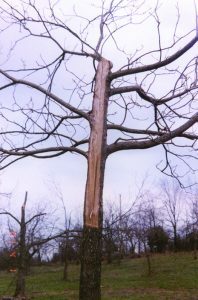 Severe weather is a fact of life in Oklahoma, with storm-related damage a major impediment to maintaining healthy trees. Ice and wind have the power to snap limbs and large branches leaving landscapes littered with storm-damaged trees. While we cannot control the weather, we can implement measures to manage storm-damaged trees and minimize risk to people and personal property. This fact sheet is designed to address many common questions posed by property owners following storm damage. 1. Use common sense and ask yourself if the damage has perhaps rendered this tree hazardous? In other words, does it now look vulnerable to any additional wind or ice event that could cause it to fall in its entirety or at least “drop” one or more large branches that could damage nearby property or prove fatal to people and pets? 2.Educate yourself as to the potential growth rate and commercial availability of replacement trees. 3.Even if the tree can be salvaged, assess whether it will ever look “right” again with some semblance of symmetry. 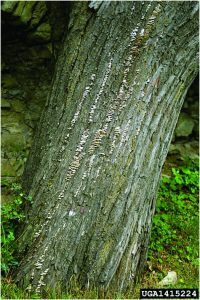 4.If significant bark has been ripped or loosened from the trunk (Figure 1), be realistic about the tree’s potential for attack from opportunistic microorganisms and damaging insects outlined later. Figure 1. Large amount of bark stripped from an ice damaged tree. Photo credits: Mike Smith, Oklahoma State University. 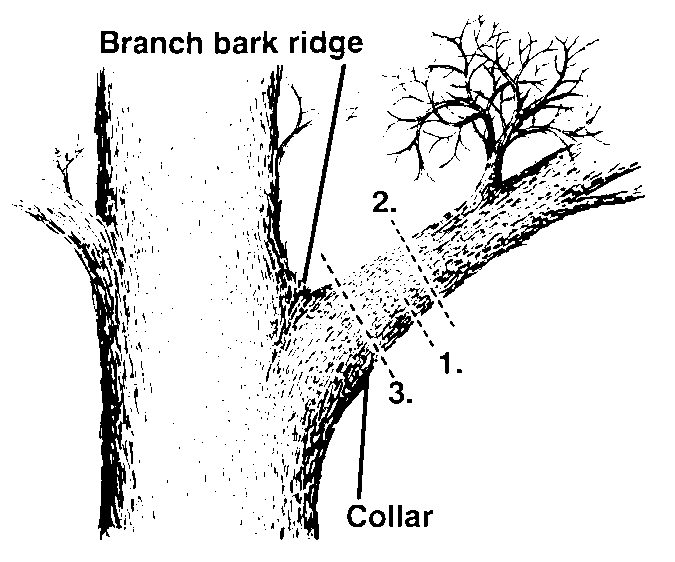 Topping or dehorning (Figure 2) permanently ruins the structural integrity of the tree. 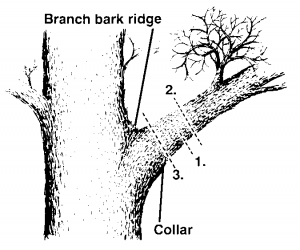 This practice leads to adventitious or epicormic shoots (shoots or new growth that is weakly attached to main scaffold branches or limbs) (Figure 3). This adventitious growth is likely to break away from the tree during a future ice or wind storm. Besides negative impacts on structural integrity, such severe pruning practices compromise the attractiveness of the tree. Many storm-damaged trees are too large for property owners to rehabilitate or remove themselves. 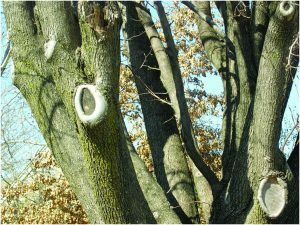 In these cases, a professional arborist should be consulted for the job. Hiring an arborist should be similar to hiring other professionals around the home such as plumbers, electricians, and carpenters. Do your homework–ask your friends and neighbors for recommendations. Additionally, be sure the individual you hire is certified by the International Society of Arboriculture (ISA). Most reputable arborists will tout their ISA status in the yellow pages or other means of advertisement. You can search for ISA-certified arborists in your area at the following URL: http://www.isa-arbor.com/faca/findArborist.aspx?utm_source=homepageclicks&utm_medium=homepagebox&utm_campaign=IAmA. Finally, make sure the arborist you select is insured. More than 50 fatalities nationwide are reported each year from professionals removing or pruning trees. Needless to say, the accident rate is much higher for people not trained in this specialized work. Consumers should be confident about the size and magnitude of the “job” to avoid trees falling on them, electrocution, or other catastrophic events. 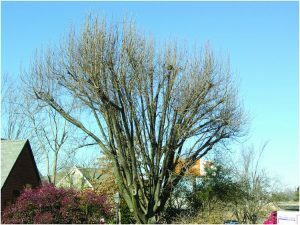 Even if a person is comfortable with heights, many other safety considerations come into play when pruning mature trees. Is appropriate equipment available? Is someone available to perform an aerial rescue if necessary (i.e., backup arborist)? Is there apparent risk to people or property from falling limbs? When in doubt, hire an ISA-certified arborist. Proper pruning is critical to facilitate quick wound response by the tree (compartmentalization). Compartmentalization results in the isolation of microorganisms or barriers to insects to prevent them from causing further damage to the tree. Trees initiate compartmentalization in their sapwood very quickly following injury. This helps combat infection by invading pathogens and insects. 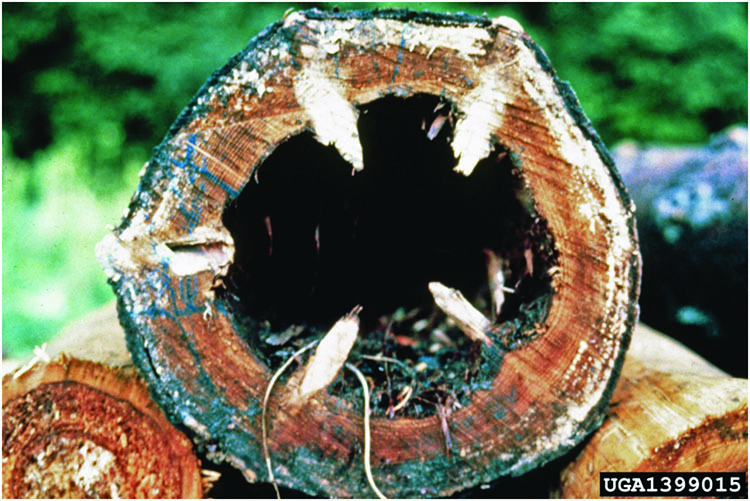 Compartmentalization of wounded sapwood results in the complete isolation of the invading organisms, resulting in formation of the “reaction zone.” Heartwood decay occurs up to the sapwood reaction zone. 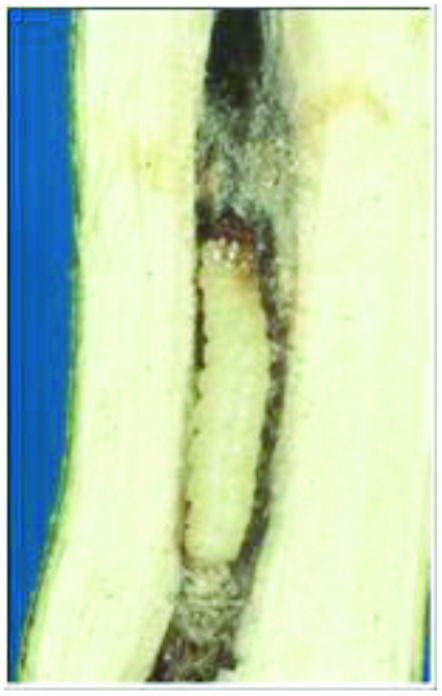 Some organisms can detoxify reaction zone compounds, causing the continuous retreat of heartwood, and trigger the formation of a new reaction zone in the sapwood (build-up of callus tissue) (Figure 4). Wound dressings (i.e., pruning paints) after pruning are no longer recommended. 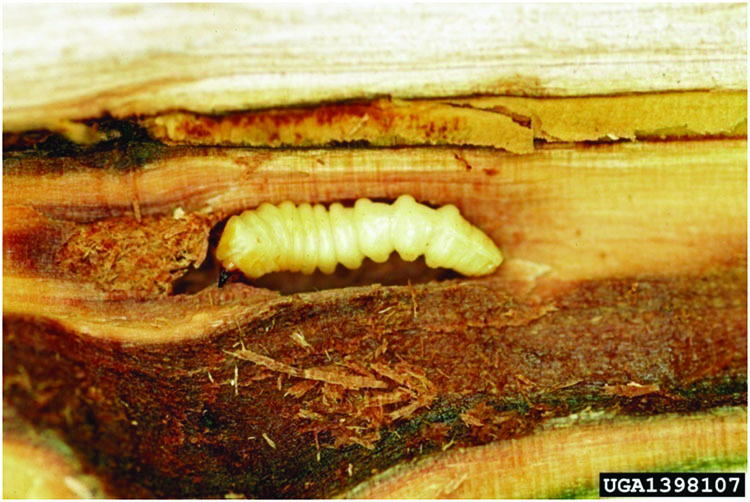 Wood has the ability to quickly form barriers to pathogen and insect invasion. In some cases, researchers have determined pruning paints are counterproductive to wound closure. Figure 4. 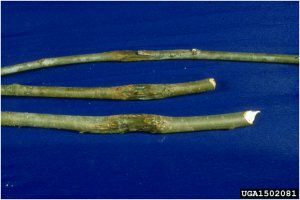 An example of desirable callus buildup following proper pruning of several limbs. 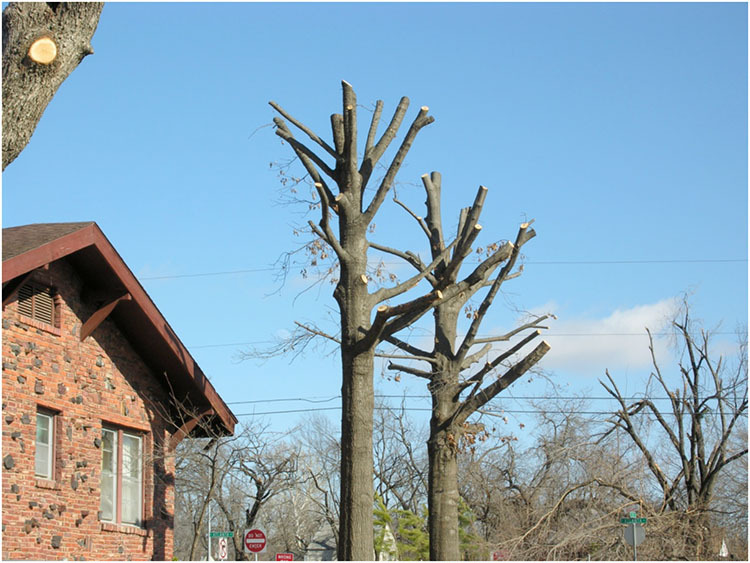 First, remove all broken or damaged limbs, which are the most hazardous to people and property. Never remove more than one-third of the branching system of any tree. If more than one-third of the branches have been damaged by wind or ice, consider tree removal rather than attempting to salvage the tree. Cut limbs back to a lateral branch that is nearly one-half the diameter of the removed limb. Do not leave stubs as this is unsightly. To avoid further damage to the tree, use the three-cut pruning method (Figure 5) (see OSU Fact Sheet HLA-6409 for details). Figure 5. The three-cut method for removing heavy limbs. Many microorganisms that occur in and upon trees (endophytes) exist naturally in plant tissue or in soil without causing disease. However, these same microorganisms can become pathogens when a tree is environmentally stressed or damaged by the prevailing weather. Microorganisms of this nature are considered opportunistic pathogens. 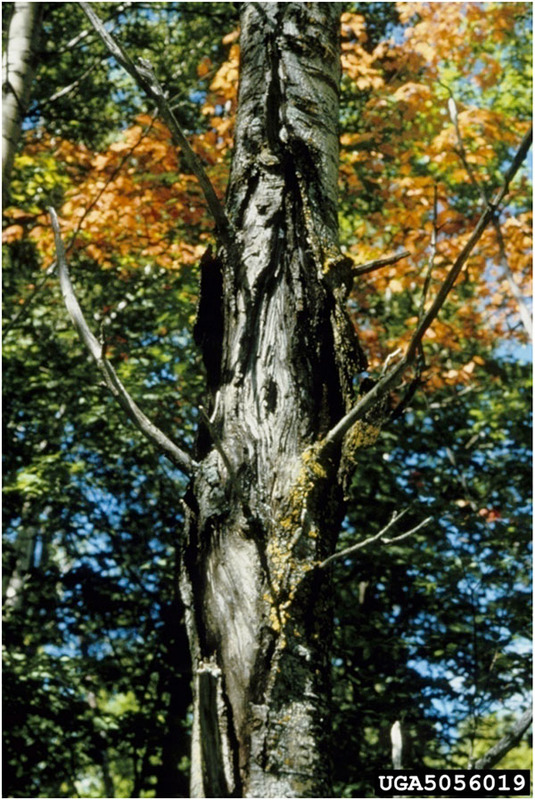 Examples of pathogens of the opportunistic type are Biscognauxia atropunctata, which causes hypoxylon canker (Figure 6) on several species of trees including oaks; fusarium cankers (Figure 7) caused by several species of fungi in the genus Fusarium; and Nectria cankers (Figure 8) caused by several species of fungi in the genus Nectria. 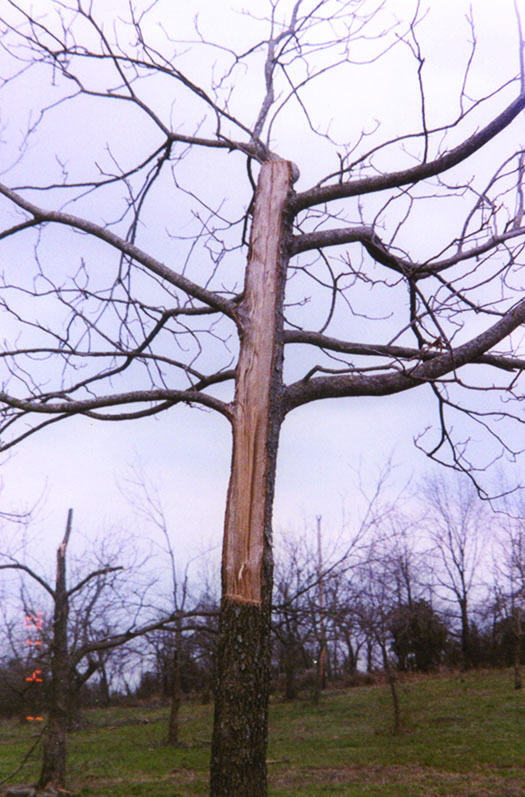 Damage from ice and wind storms also creates points of infection (infection courts) for wood decay microorganisms. 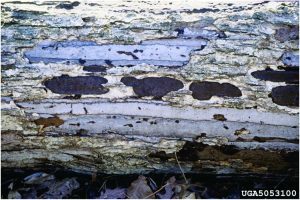 In living wood (sapwood), pathogens are capable of invading damaged sapwood and are tolerant to chemicals in the reaction zone of tree wounds. Microorganisms of this nature include the fungus Schizophyllum commune (Figure 9) among others. In dead wood, (heartwood), pathogens can enter through deep wounds in sapwood or through broken limbs. 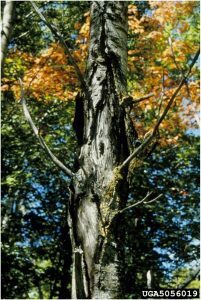 Examples of this scenario are trunk and limb rots caused by the fungus Stereum (Figure 10). Reducing tree stress and proper pruning of damaged trees can help manage diseases caused by opportunistic pathogens and wood decay microorganisms. 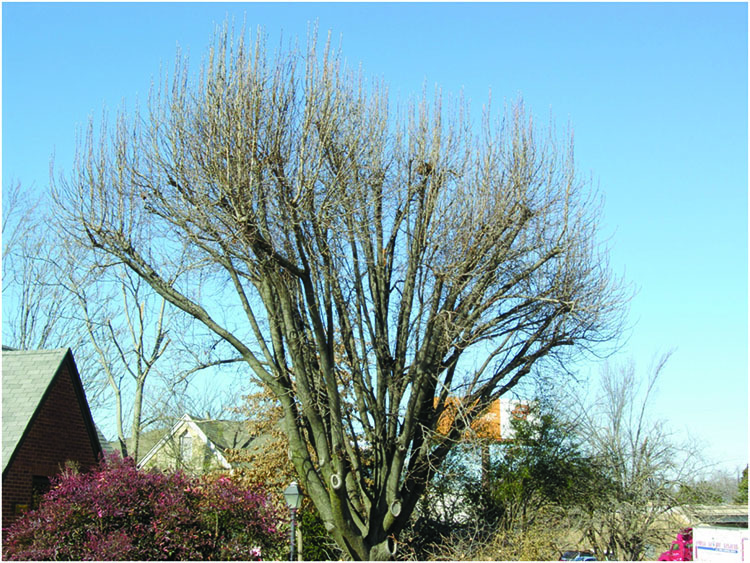 Carefully maintaining nutrient and water requirements and properly pruning damaged trees (see section above) will help keep your prize-winning landscape specimen disease free. Figure 6. Hyploxylon canker of oak (Quercus spp.). Photo credits: Joseph O’Brien, USDA Forest Service, www.bugwood.org. Figure 7. 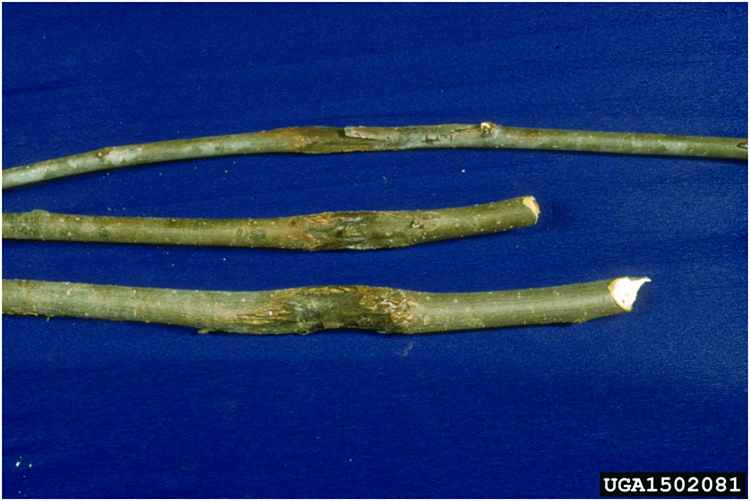 Fusarium canker on small twigs. Photo credits: USDA Forest Service – Region 8 Archive, USDA Forest Service, www.bugwood.org. Figure 8. Nectria canker on a tree trunk. Photo credits: Joseph O’Brien, USDA Forest Service, www.bugwood.org. Figure 9. 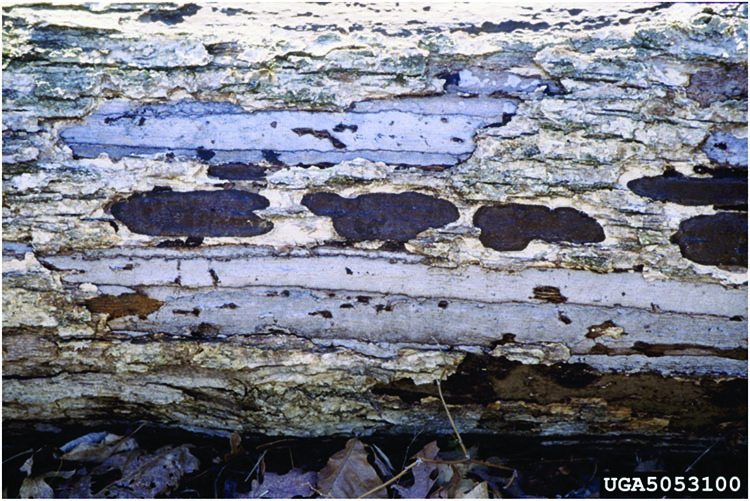 Sapwood decay caused by the fungus Schizphyllum commune. Photo credits: Andrej Kunca, National Forest Centre – Slovakia, www.bugwood.org. Figure 10. 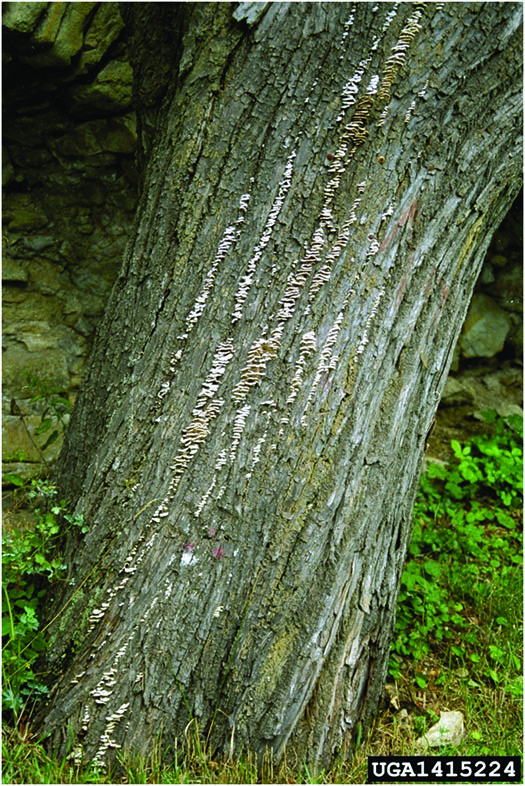 Heartwood decay caused by fungi of Stereum spp. Photo credits: Manfred Mielke, USDA Forest Service, www.bugwood.org. Many wood-boring insects naturally colonize weakened or dying trees, aiding in their decomposition and reducing competition for healthier trees. 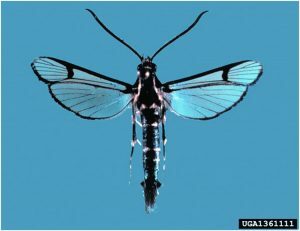 These insects become pests only when their biology conflicts with people’s interests in a tree’s survival. 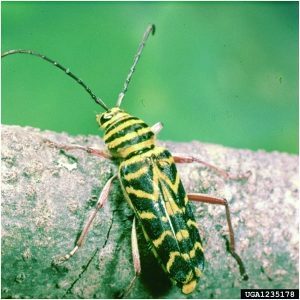 These insects are especially problematic when they attack storm-damaged trees. 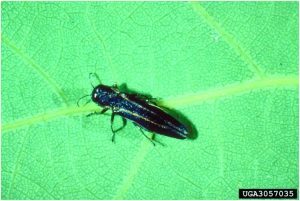 Adult woodborers orient toward storm-damaged or otherwise stressed trees by detecting chemicals emitted by the trees. These chemicals diffuse in the air and attract wood-boring insects from the surrounding landscape. Females deposit eggs on the outer bark or within plant tissue. 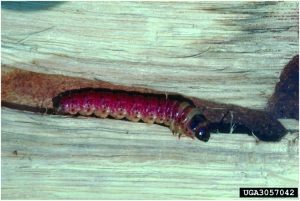 Emerging larvae bore into deeper tissue and feed just under the bark, in sapwood, or in heartwood of stems and branches. 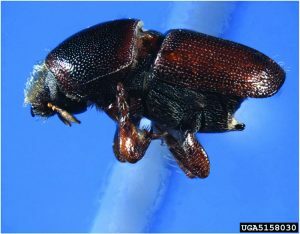 Some woodborers can serve as vectors, transmitting certain plant diseases (e.g., elm bark beetles are vectors of Dutch elm disease). 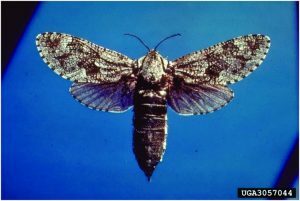 Common wood-boring pests in Oklahoma (see EPP-7315 for details) include: Flatheaded borers – larvae of metallic wood-boring beetles (e.g., bronze birch borer, Agrilus anxius, twolined chestnut borer, Agrilus bilineatus) (Figure 11); Roundheaded borers – larvae of longhorned beetles (e.g., pine sawyer beetle, Monochamus spp., cottonwood borer, Plectrodera scalator) (Figure 12); Clearwing borers – larvae of clearwing moths (e.g., lilac or ash borer, Podosesia syringae, peachtree borer, Synanthedon exitiosa) (Figure 13); Carpenterworms, Prionoxystus robiniae – larvae of a large, grey moth (Figure 14); Bark beetles – adults and larvae of several weevil species (e.g., smaller European elm bark beetle, Scolytus multistriatus) (Figure 15). Many wood-boring insect pests can be managed with insecticides. 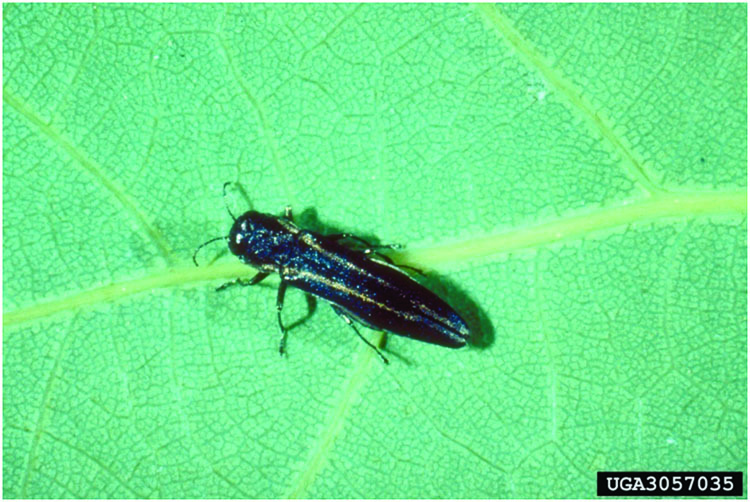 Trunk and limb applications of pyrethroids can help, but timing is critical (treatment should coincide with adult woodborer activity) and proper coverage can be difficult for large trees. Systemic insecticides (e.g., imidacloprid, acephate) either applied as soil drenches or trunk injections may work if timed properly (treat several weeks in advance of activity of young larvae) and tree has enough vascular tissue remaining intact. Systemic insecticides also reduce non-target effects and eliminate problems associated with pesticide drift. Insecticide use can usually cease once the storm-damaged tree recovers, but remain vigilant for further signs and symptoms of woodborer activity. Figure 11. 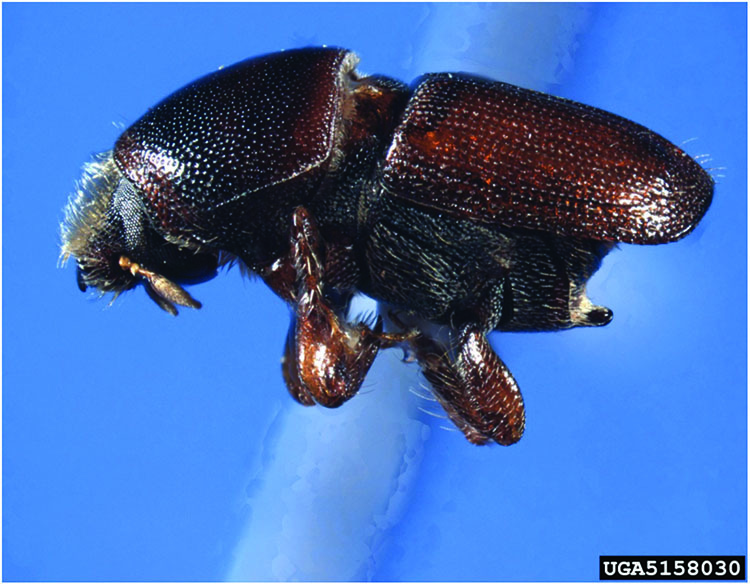 Twolined chestnut borer, Agrilus bilineatus (top) adult and (bottom) larva. 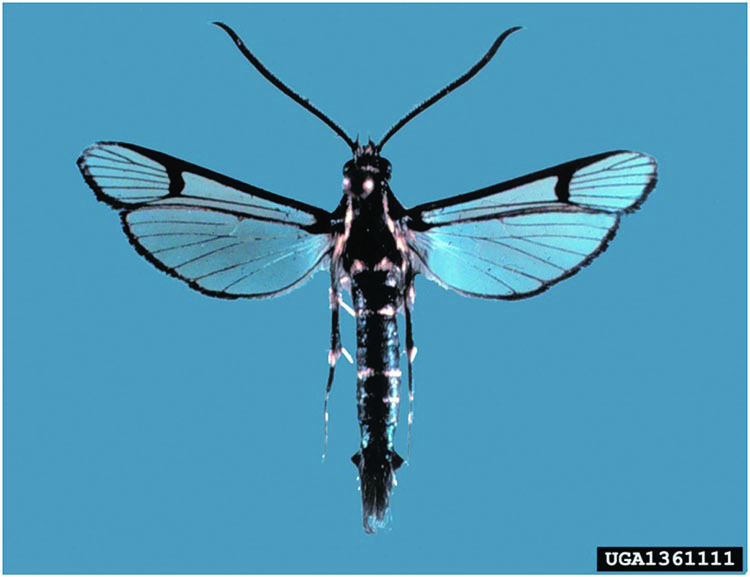 Photo credits: Robert A. Haack, USDA Forest Service, www.insectimages.org. Figure 12. (top) Locust borer, Megacyllene robiniae adult and (bottom) Asian longhorned beetle, Anoplophora glabripennis larva. Photo credits: (A) Clemson University – USDA Cooperative Extension Slide Series www.insectimages.org: (B) Steven Katovich, USDA Forest Service, www.insectimages.org. Figure 13. (top) Peachtree borer, Synanthedon exitiosa adult and (bottom) banded ash clearwing, Podosesia aureocincta larva. 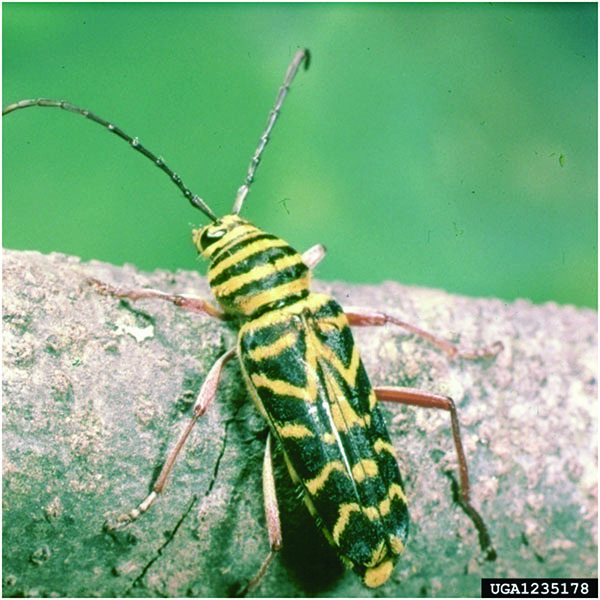 Photo credits: (A) Wendell Snow, USDA Agricultural Research Service, www.insectimages.org; (B) David Nielson, Ohio State University/OARDC. Figure 14. 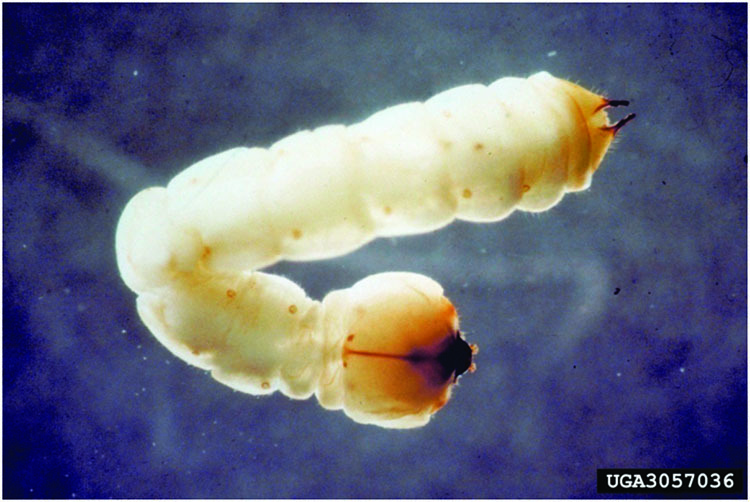 (top) Carpenterworm, Prionoxystus robiniae adult female and (bottom) larva. 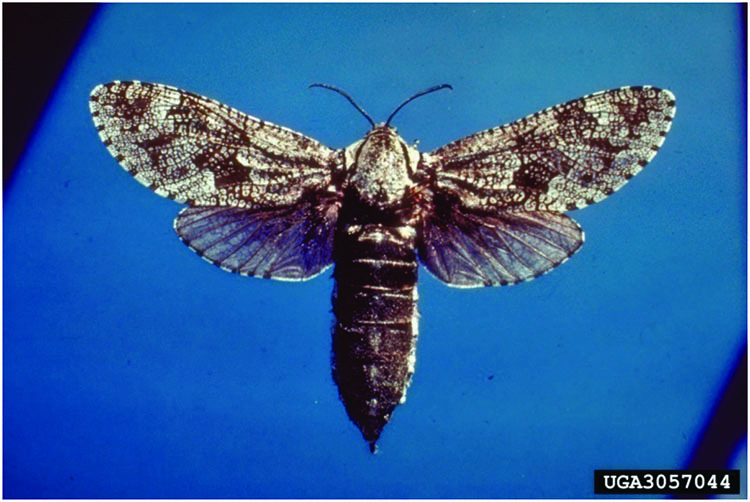 Photo credits: James Solomon, USDA Forest Service, www.insectimages.org. Figure 15. Smaller European elm bark beetle, Scolytus multistriatus. Photo credits: J.R. Baker & S. B. Bambara, North Carolina State University, www.insectimages.org.